Get adventurous in Skagway with three outdoor activities in one 5.5-hour combo tour. You'll bike through the rainforest, hike on the Chilkoot Trail, and take a scenic float down the Taiya River. Select a morning or afternoon departure time when booking. 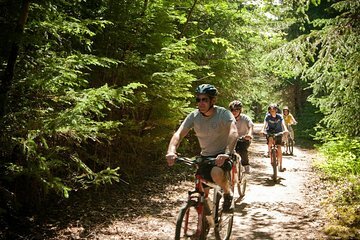 Your tour starts in downtown Skagway where you'll meet your guide to begin the first part of your 3-activity experience — biking through the coastal rainforest. After you are fitted with a bike, follow your guide on a 5-mile (8-km) journey of easy pedaling along flat dirt roads. Pass by tidal flats and stop at historical and natural sites to look for eagles, see wildflowers, and admire the mountain views. At the end of the biking segment, your guide takes you on a 2-mile (3.2-km) hike on the Chilkoot Trail, a historical route used during the gold rush days. For the first mile, trek up and down across uneven terrain before enjoying a relatively flat walk for the second mile. Make stops to hear from your guide about the region and snap photos. When your hike ends on the bank of the Taiya River, your third activity starts. Put on your provided rubber boots and life jacket and hop on your raft for a leisurely float along the water. There are no rapids, so you'll enjoy a relaxing ride to look out for bald eagles and river otters. Your tour ends with transfer back to Skagway. Stop sending this to me, it is about the 6th time you keep asking how the trip was and I sent an answer a long time ago, I said it was nothing special and not near the 250 EACH were charged, never again with Viatour! A great way to see the natural wonders of Alaska via three modes of transportation. Our tour guide Bob was great fun and had a vast knowledge of the area. This tour is the way to see the Chilkoot trail, while being active. The guides were nice, organized, and informative. We enjoyed all aspects. The float trip is quick but it is pretty, a little cold with the rain. The hike is no joke- be prepared to climb but it is beautiful. The bikes are rough in the dirt/rocks but there are no hills. The whole group, of all ages and fitness levels, were very pleased! Very enjoyable. Be prepared to hike up a steep mountain. Guides were very professional. Guides were all friendly and knowledgable and our family had a great time riding, hiking and rafting in this beautiful environment. Couldn't have been better!